Rory Scannell landed a long-range penalty with the final kick of the game to earn Munster a thrilling 25-24 win over Glasgow Warriors at Thomond Park. Glasgow seemed on course for a bonus-point win with 20 minutes to go after the Horne brothers had combined for 19 points and Matt Fagerson also scored. The Irish side countered with tries by Alex Wootton and Alby Matthewson before Scannell's 80th-minute kick. The win moves Munster up to third place in Conference A.
Glasgow remain top of the conference standings but their lead over Ospreys has been cut to four points although head coach Dave Rennie can take some comfort from the two losing bonus-points earned by his understrength panel. George Horne scored two tries while his brother Pete got the bonus-point score for Warriors, who were without 11 of the 16 players named in the Scotland squad for the Autumn internationals. Munster, who took the lead when James Cronin scored the opening try, had to dig deep to protect their unbeaten home record this season after they had slipped 24-10 down with 20 minutes remaining. Both teams had to make late changes to their starting line-ups as Munster's Andrew Conway and Warriors' DTH van der Merwe were replaced by Darren Sweetnam and Niko Matawalu respectively with the introduction of the Fijian star adding to Glasgow's counter-attacking ability. In a feisty start to the game, Munster quickly settled to their task with Keith Earls continuing his impressive run of form with an early attack to bring his side to within striking distance before James Cronin was shunted over the line by his front-row colleague John Ryan. Glasgow's discipline was poor during the opening exchanges but Munster were unable to convert their chances and paid the price when they lost possession deep in the Warriors' half. Rory Hughes gathered a superb Fagerson pass before dashing up the left wing and his inside pass found Pete Horne, who had younger brother George running a trademark support line and the scrum-half held off the chasing Earls to score in the corner. The home side failed to learn their lesson and were under their own posts once again in the 36th minute when Mathewson's loose kick was returned with interest by Nick Grigg and the centre found George Horne for a stunning score. 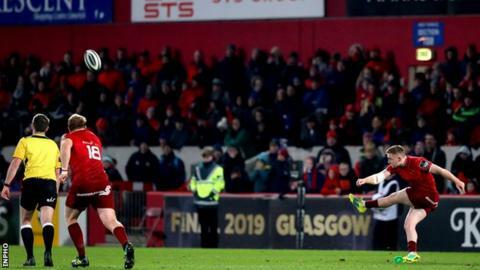 Glasgow were back on the front-foot from the start of the second half thanks to another searing break by Grigg, who was hauled down just short of the line by Darren Sweetnam. Munster captain Peter O'Mahony then had to make a try-saving tackle on Ruaridh Jackson but the Television Match Official had spotted an off-the-ball tackle by Chris Cloete in the build-up and, with the flanker in the sin bin, the Munster pack were powerless to stop Fagerson from thundering over. Hanrahan attempted to spark something for the home side when he stepped inside Scott Cummings and scampered towards the posts but he was held up over the line by three covering defenders and Munster ultimately had to settle for a penalty. The Horne brothers switched roles for the visitors' fourth try as George's well-judged chip was gathered by a charging Pete, who converted his own score to push Glasgow into a commanding 10-24 lead. The bonus-point secured, Glasgow's intensity slipped a couple of notches and Munster jolted the Limerick crowd into life with a much-needed try. The home side were rewarded for a change in approach as they patiently retained possession and sucked in the Glasgow defenders before swinging the ball left where Mike Haley drew the tackle and slipped Wootton over in the corner. Substitute Ian Keatley missed his conversion attempt but had another opportunity seven minutes later when another well-worked attack created the tiniest of cracks for Mathewson to dive and stretch to brush the ball against the whitewash. A 14-point lead had been whittled down to two points but Glasgow appeared to have weathered the storm as they held possession with just seconds to spare until O'Mahony forced another turnover just inside the half-way line and Scannell's booming kick delivered another classic Thomond Park victory. Glasgow Warriors head coach Dave Rennie on BBC Radio Scotland: "I was really proud of the guys. It's tough to come over here against a really strong Munster side and I'm really proud of the effort. "Obviously disappointed to lose in that fashion - we're one ruck away from winning. It's a game of inches at this level. Munster are smart - they isolated the ball-carrier by taking out his support and they won the penalty. "We'll take two points but five was on offer with 10 seconds on the clock.